As of the middle of 2014 we have found out that my youngest sister has also got the same kidney disease that I have, I am devastated but I hope that by the time her kidneys completely failure medical advances will mean she will not have to go through everything that I did. 2nd Update As of October 2018 – My sister has now received a kidney transplant from a deceased donor just over a year ago, all is going well. I am currently on my second pregnancy with no complications so far, my first pregnancy ended 18th January 2017 at 34 weeks 4 days when my perfectly healthy son Levi was born 1:16 pm weighing a healthy 5.59 lbs. So I have hinted a bit about my health troubles this year but I think its time I sit down and actually write about everything I have been through this year and all my previous struggles. Not only to give people out there an understanding of life with kidney failure but also to help me let go of all of this trauma and the harsh memories that I have been holding onto. In 2001 at the tender age of 12 years old I was diagnosed with Kidney (Renal) Failure. My kidneys had slowly been shutting down ever since I was born thanks to a wonderful genetic disorder that both my parents unknowingly had. I had a 1 in 4 chance of developing this disease and of course, with my luck I did, thankfully my none of my 3 little sisters developed the disease though. I managed to hold of end-stage renal failure (transplant time) with a very strict diet and large quantities of medication, which I was never that great at taking. Cut to 2005 I’m now the extremely mature age of 16 (well at least I thought I was mature!). My family went on an amazing 3 week trip to America, probably one of the best holidays I have ever been on. We got back all feeling a million bucks, we had had the time of our lives. Unfortunately for me, my kidneys had finally decided they had enough! It was time for some serious action! My doctors decided to try hemodialysis in order to give them enough time to start the work up for a kidney transplant. Hemodialysis is a way in which a machine performs the same functions of the kidneys which include removing unwanted “rubbish” from the blood (Creatinine) as well as excess fluid that is not removed once the kidneys have failed. This process of cleaning the blood through a machine filter takes around 3 to 4 hours and is usually performed 3 times a week. The dialysis machine connects to 2 tubes which each contain a rather large needle. These needles are connected to the fistula, one needle draws the blood and pumps it through the machine whilst the other pumps the processed (clean) blood back into the body. Usually, blood pressures are taken every half hour or so as to monitor the pressure, the machine withdraws excess fluid and creatinine, if the machine is removing all of this too fast then the patient’s blood pressure drops and you can begin to feel nauseous. Now in order to have hemodialysis they needed to loop up a vein and artery to create a strong blood flow to access, this is called a fistula. Of course with my luck my veins branch of at my shoulders instead of my elbows this means I have very small veins and when they began the operation to create a fistula they found that my veins are unsuitable for this procedure. Unfortunately, because I was unable to receive a fistula I had to undergo the next best thing, a Permacath. 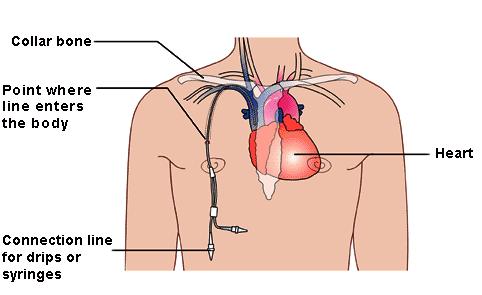 A Permacath is a catheter that is used as an access line to an already strong flow of blood, the blood from the right atrium of your heart. 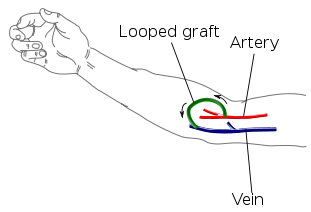 In order to access this blood, they must tunnel a line from under your collarbone down a blood vessel and then into the heart. Once the skin has been thoroughly cleaned they place the line using a local anesthetic around the entry site. Thankfully as I was only 16 years old I was placed under general anesthetic. The Permacath is a temporary dialysis solution and I only used mine for around 3 months. After 3 months on dialysis, I was lucky enough to receive a kidney from my mother. It wasn’t the easiest recovery and thanks to the new medications I gained around 30kgs in the following months and developed a “moon face” which is just what a 16-year-old girl wants. I managed to look after this kidney till 2009 when I was around 20 years old. I had left home and was living with what I would call an “abusive” partner. Although he only hit me a few times he was extremely emotionally abusive, he disliked my family and wouldn’t let me see them, he spent all the money I earnt on his cigarettes (of course he never worked) and he often made me feel lower than I ever imagined I could feel. This all meant that when my supply of transplant medication ran out, the money that I would have used to buy more was gone and as I wasn’t allowed contact with my family (I wasn’t really allowed out of the house unless he said) I stopped taking them and my transplant started failing in around a week. I feel that my kidney failing helped me get away from this relationship, I remember lying curled up in the shower vomiting and vomiting for hours and I really thought Oh No I’m going to die in this losers crappy little shower, so I called my mum!. Now I wouldn’t say he caused my transplanted kidney to fail and I wouldn’t call him accountable as it was my kidney and I was the one looking after it but I feel that if I had never met him then maybe it wouldn’t have failed when it did. After my mum “saved me” I was taken to hospital where we discovered that yes my transplant had failed. So later that week I was booked in to have another Permacath placed in my chest. Unfortunately for me this time they didn’t put me under general anesthetic and I only had local. I remember the nurse telling me that they couldn’t use anything to relax me or slightly knock me out, they were only using the local anesthetic. It was the MOST traumatic experience of my life, it didn’t hurt when they cut the skin but when they began tunnelling under my collarbone and down into my heart I remember screaming and crying and begging the doctor to stop, I had tears streaming down my face and there were around 8 people holding me down most of who where also crying. I don’t wish that experience on anyone it was truly horrifying. I still to this day sometimes get nightmares about that experience and feel ill just writing this. After that was over I once again had Hemodialysis for a few months before they decided to place me on Peritoneal dialysis. 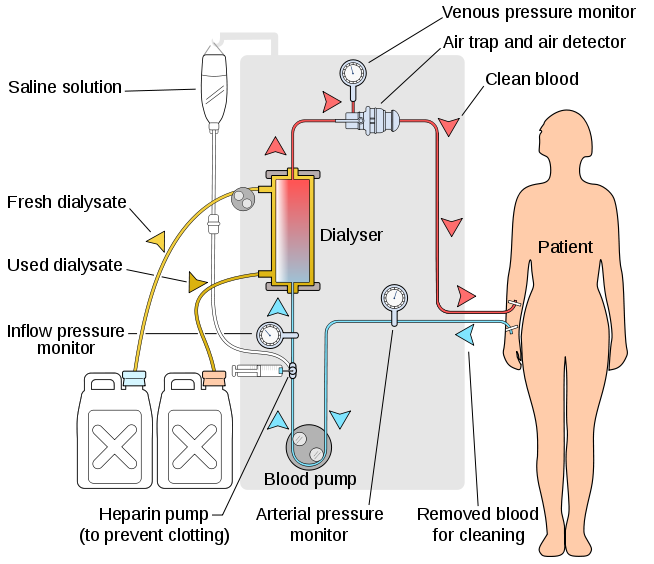 This form of dialysis does not require the use of a patients blood, instead, it uses the process of osmosis. This is achieved by placing a substance in the patient’s peritoneum (the “sack” that contains all the vital organs except the kidneys) and then left over a period of time then drained and repeated every night. Whilst this substance sits in the peritoneum Creatinine and excess fluid slowly filters across from the blood vessels that cover the outside of the peritoneum into the solution that is waiting to be drained and refilled. I maintained a cycle of a 6-litre bag left for 3 hours then drained and replaced three times a night for a total of 10 hours plus I also had a smaller 3-litre bag left in my stomach all day and drained first when I went to bed. The Blue Liquid shows the stages of the liquid entering and sitting in the body whilst the Yellow Liquid shows the liquid sitting in the body then being removed. In order for me to receive Peritoneal dialysis, I had a small catheter placed through my stomach and into my peritoneum cavity. This catheter was placed next to my belly button (I have had this removed for over a year now and I still have a small hole where it used to sit, it looks like a second tiny belly button as it sealed up on the inside like a belly button). I was then trained up as to how to use a Peritoneal dialysis and started using it every night at my house. By this stage I was almost 21, I had now bought my own house and was working full time. I found that although Peritoneal dialysis cut into my nightlife I enjoyed the freedom of not needing to visit the hospital 3 times a week. After just over a year of Peritoneal dialysis, I developed appendicitis which meant the catheter had to be removed so I once again needed a Hemodialysis. This time I was given a VasCath which is similar to a Permacath with the exception that just above the exit site for the line there is a small fibrous material placed under the skin which helps secure the catheter as the skin grown into it. A VasCath is a more permanent solution than a Permacath as the doctors where unsure how long I would need dialysis. When it came to having the VasCath placed in my chest I was a bit apprehensive and was extremely relieved to learn that the doctors were able to give me some medication to relax me and slightly knock me out which meant that as soon as the procedure began I thankfully fell asleep. I again continued with Hemodialysis for around 6 months, during this time I gradually began getting sicker and sicker, I also had to move back home as my family did not want me living so far away from the hospital and I was also unable to drive at this point. Occasionally I would stay at my boyfriends’ house and he would drive me to the hospital and stay with me for the 4 hours whilst I had dialysis in the evening. I found that whilst I was on the dialysis machine I would feel better but as soon as I got off I would lose all energy and be in large amounts of pain. It got to the point where I would go straight home hop in bed and stay there till my next appointment. At this time my Creatinine level was 1800 μmol/L, a normal healthy Creatinine is around 45-90 μmol/L. The doctors had decided that they were going to give me a kidney from my father, they cross-matched our antibodies to ensure I could I would be compatible. Everything seemed perfect and we were just over a month away from the transplant when they found that unfortunately, I had a small number of antibodies that would affect this transplant that had not been picked up earlier. 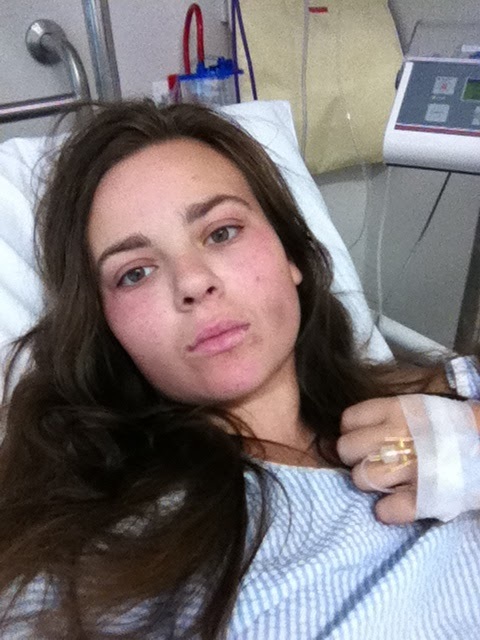 Not receiving my transplant at this stage was not an option so my doctors decided to try a new procedure to remove the unwanted antibodies, I would be the 13th patient in Australia to receive it. The process to help remove the antibodies meant I had to kill off my whole immune system and the receive donor plasma. We found out that this process had worked only 3 days before I received the kidney transplant from my father. I remember trying to sit up in recovery after receiving my new transplant because I finally felt so good I just wanted to get out of bed. I was walking around after 3 days and discharged after 8 days in the hospital. My Creatinine is now a respectable and healthy 70 μmol/L. I moved back home after a month and also went back to work. I have had my fair share of health ups and downs but that’s it now! I am healthy, happy and looking forward to having an amazing rest of my life. I hope this might give people an insight into kidney failure and if you have any questions please don’t hesitate to contact me. Wow you have been on a long journey. Thank you for sharing this.